In Common Sense Rules Deborah shares the secrets of her success, drawing on years of experience to offer advice that is both candid and straightforward. How do you turn a bright idea into a commercial proposition? How do you inspire others to get on board? Above all, how do you make sure that you stay focused and achieve the goals you’ve set yourself? The paperback, published by Random House Business Books has a cover price of £7.99. A refreshingly sensible look at an area plagued by hype and mythology. Many insights into what it takes to be a successful entrepreneur. For fans of straight-talking sass and common-sense wisdom. She gives no-nonsense tips on turning a bright idea into a commercial proposition and inspiring others to get on board. More than anything, though, the book concentrates on how to stay focused and achieve the goals you’ve set yourself. 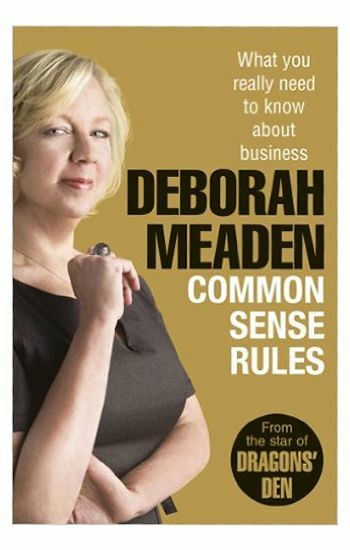 Drawing on her many years of business experience, Deborah shares the secrets of her success and offers straightforward advice that is based on common sense…a highly recommended read for an entrepreneur at any stage of a business enterprise.